...miraculous results in only one year! In the summer of 2016, I met Vangie & Jack Collins. 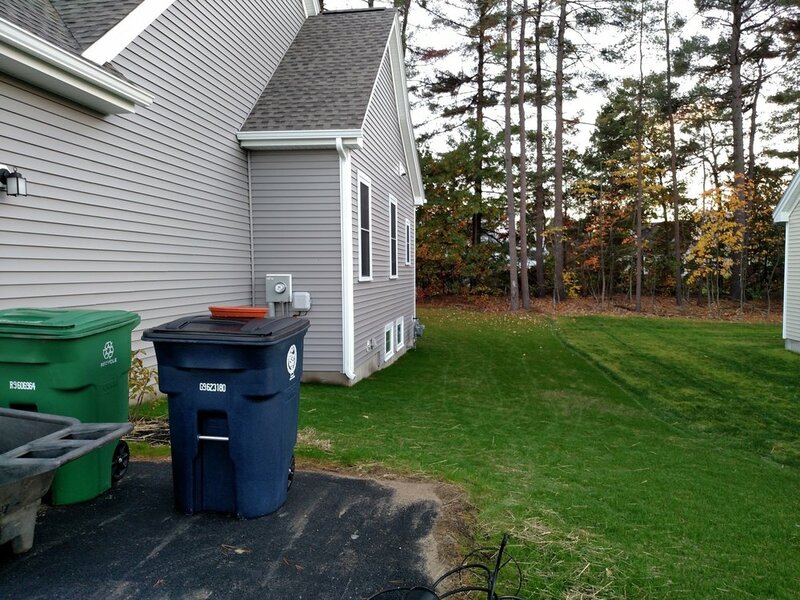 At that time, they were preparing to leave our established Nashua neighborhood and move to brand new construction a couple miles away. 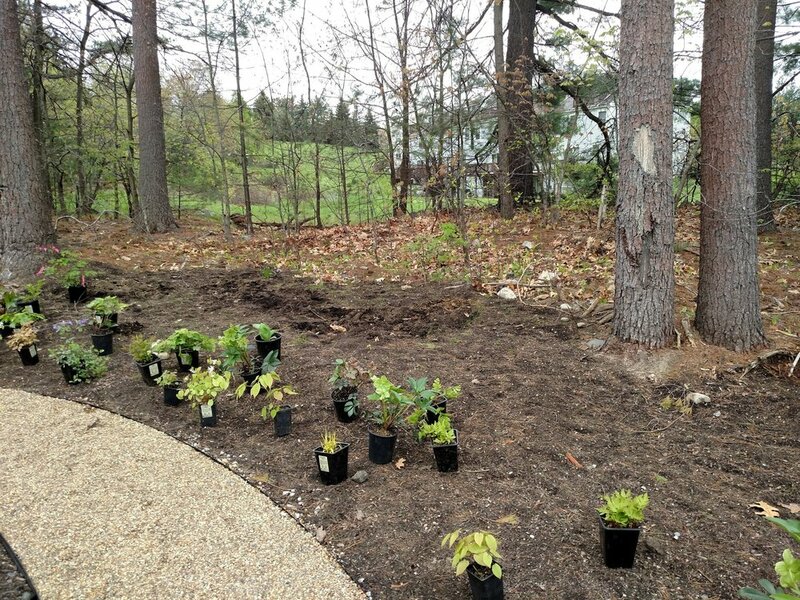 They were faced with a "blank slate" for a garden, and asked for my help. 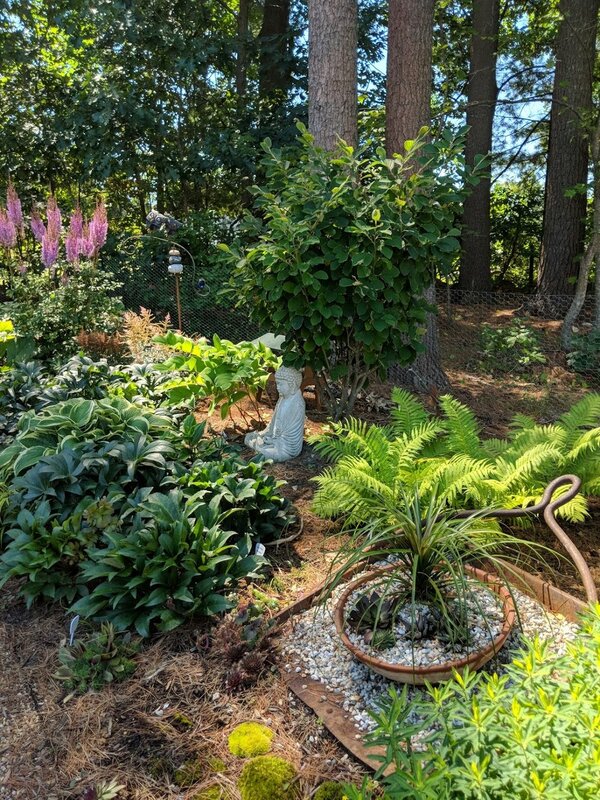 Their new home was gorgeous, but lacked landscaping and plant material, except for a few standard-issue contractor plants (one small arborvitae, a couple spirea and one lilac bush). The utter lack of established plantings from which to build a garden was intimidating to them, but exciting for me! Vangie & Jack moved into their new home just before winter of 2016 and we begin planning. 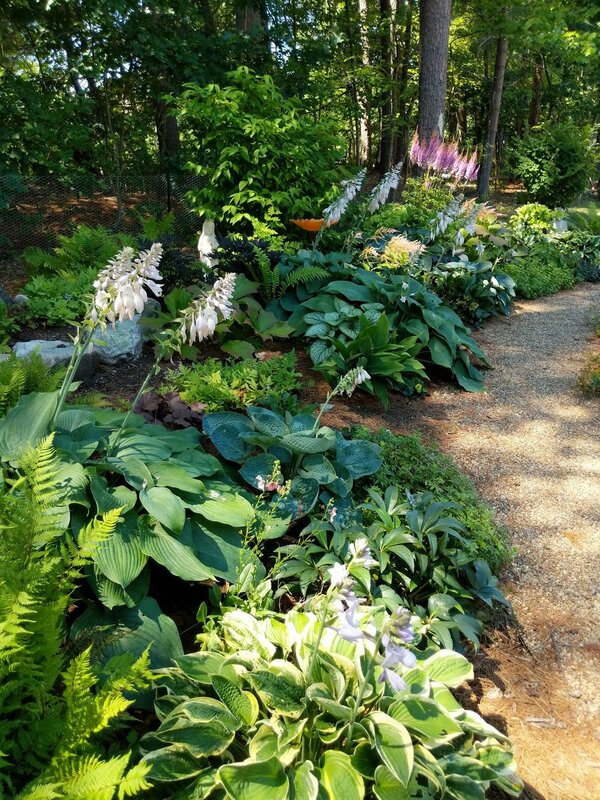 A primary requirement was a "meditation path" surrounded by calm, lush plantings. 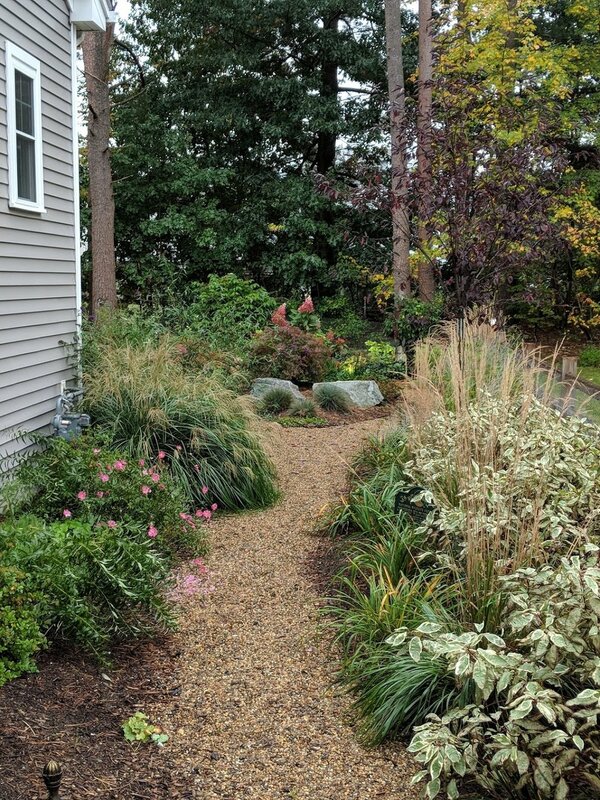 We also sought to build privacy and create extensive habitat for birds, animals and pollinators. 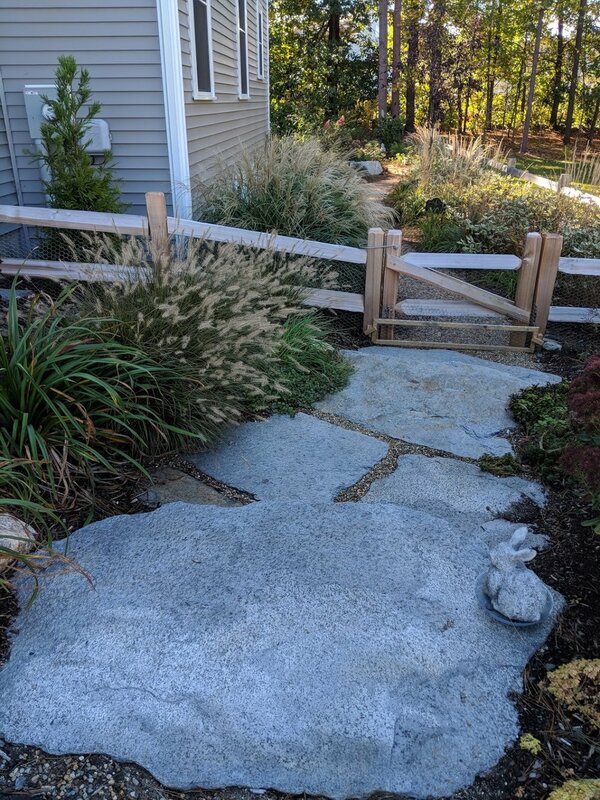 Bill Parker of Parker Garden Design joined the team and tackled installation of the path and planting of five mature hemlock trees, as well as a Viburnum and Hamamelis shrub along the back property line. 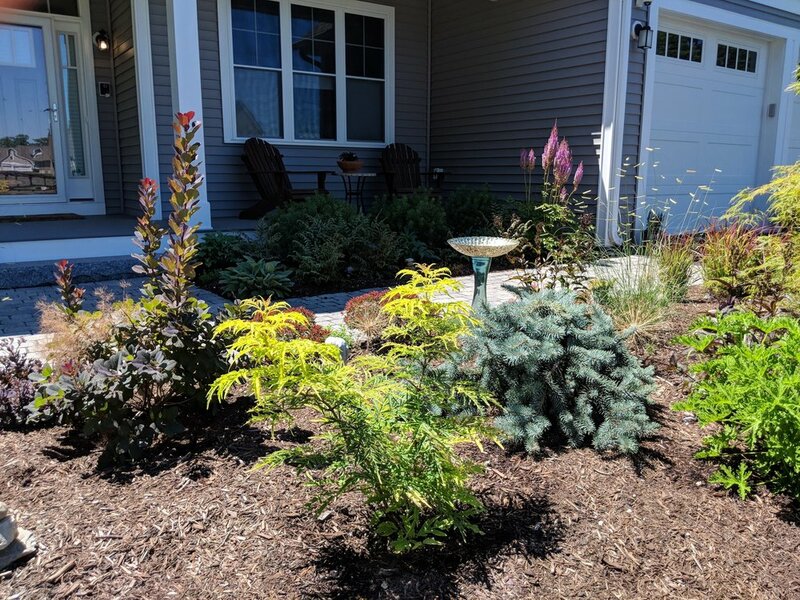 The following photos depict the project progression - from original contractor plantings, to installation of hardscaping through planting of back and front gardens. 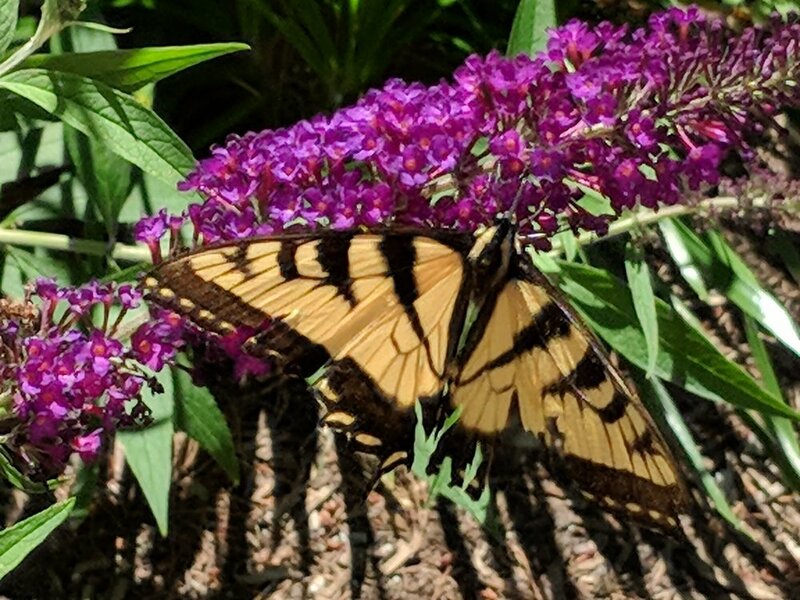 Barely a year later, plants are settled and thriving, and home to dozens of pollinator species, including hummingbirds, butterflies and bees! Note: immediately after we began planting in May of 2017, plants in the side and back gardens came under attack by bunnies! In no time, they decimated the Baptisia. So, a discreet chicken wire barrier was erected by Vangie & Jack to keep them at bay. Front gardens outside of the barrier fencing feature "bunny-safe" plants! 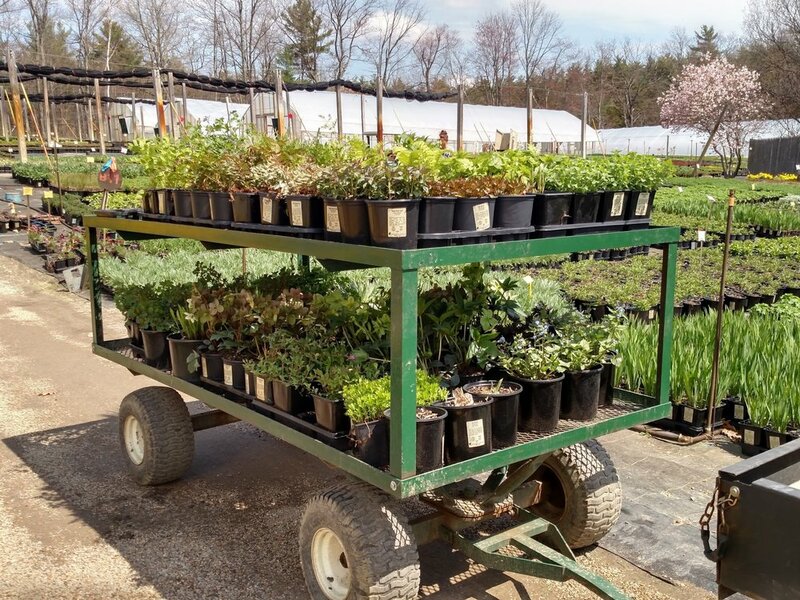 The shopping fun begins with multiple visits to New Hampshire's best wholesale plant nurseries. 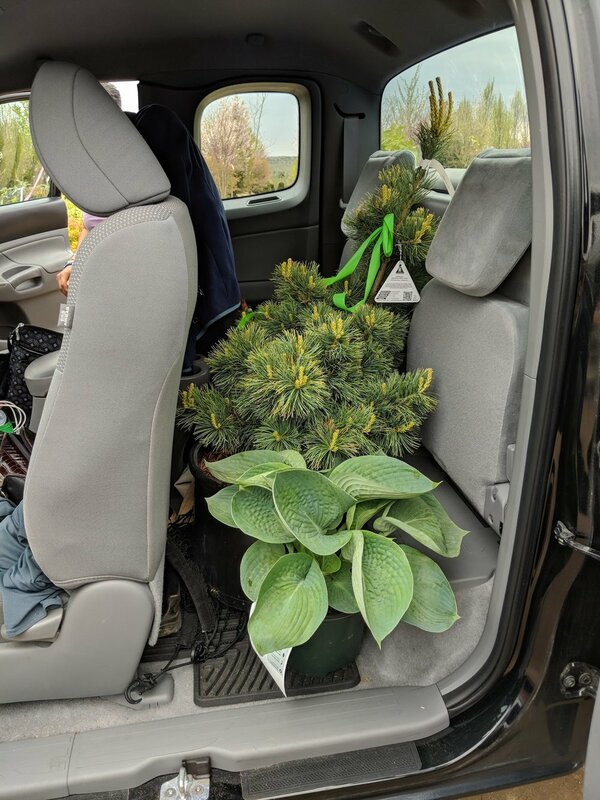 Vangie enjoyed discovering truly unique perennial, tree and shrub specimens for her new garden. Barely five months after the initial planting in October, 2017, plants are becoming established and filling in. 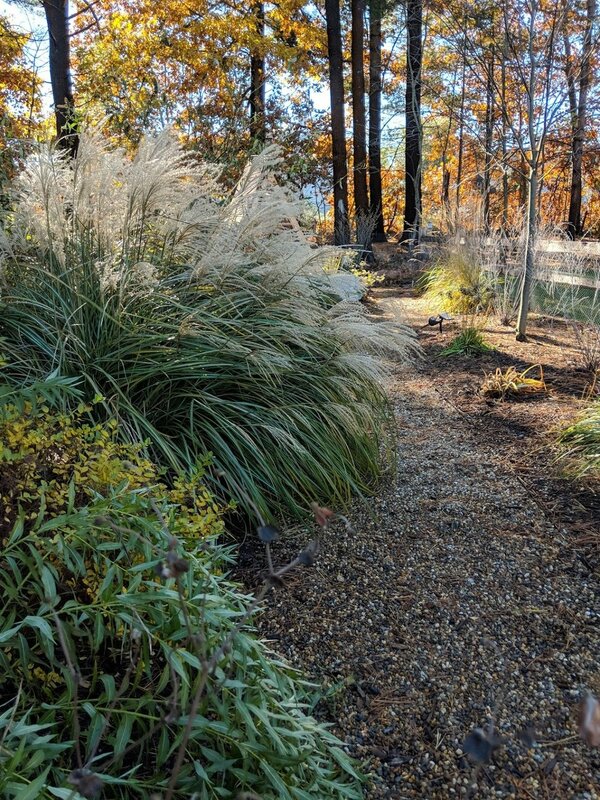 Grasses will provide textural interest deep into our New Hampshire winter season, giving way to winter blooming shrubs like Hamamelis (Witch Hazel). Pleased with our initial results, we were filled with excitement for the coming Spring time. 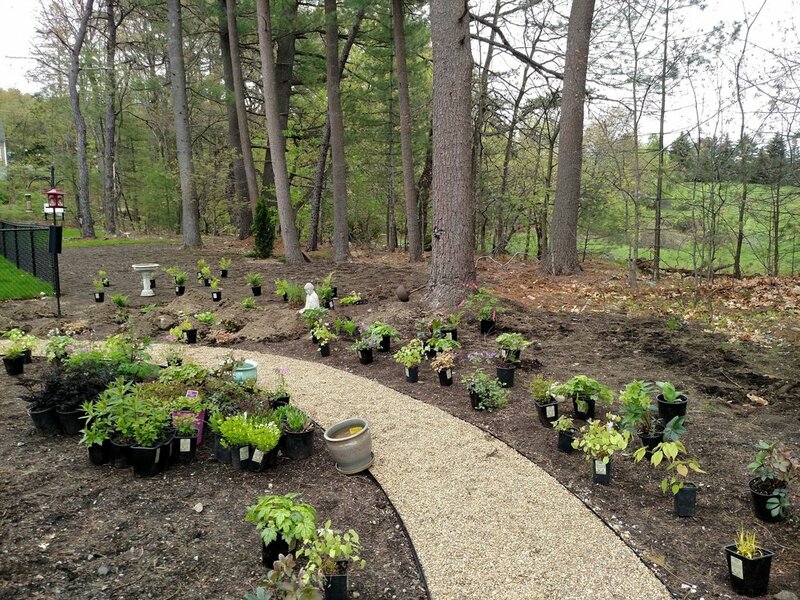 Little did we know just how amazing this garden was going to be by July of 2018! 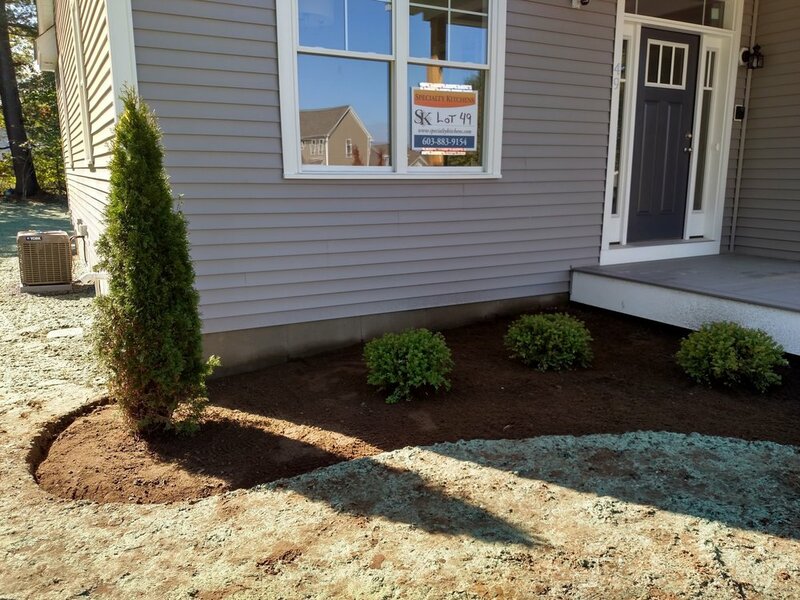 But first, we had to pick up where we left off with the front entrance garden. With the back garden well established, we turned our attention to the front of the house. 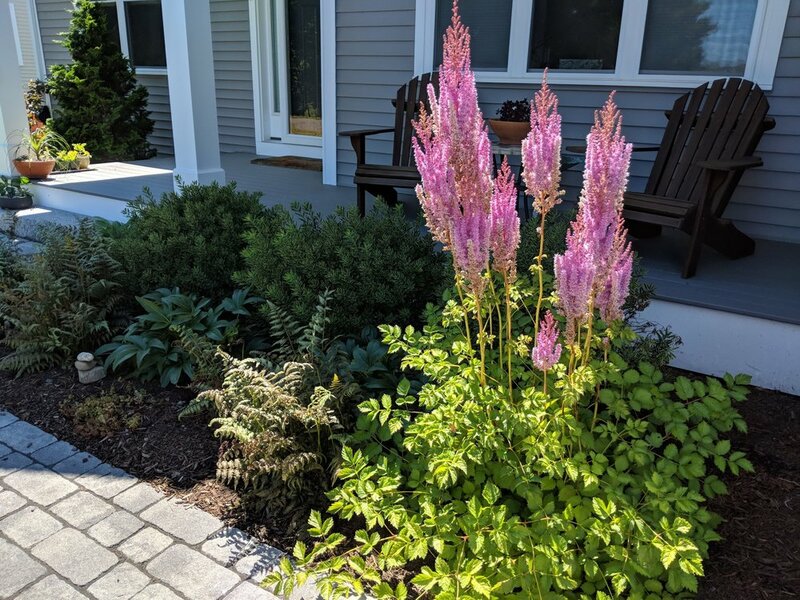 Last year, we replaced the contractor plantings with mixed perennials and a couple woody specimens, but this property needed a grand entrance to compliment the lovely home. We sourced the "bones" at Millican Nurseries in Chichester, NH. First on our list was Acer palmatum 'Viridis' which is a drop-dead gorgeous laceleaf Japanese Maple, perfect to anchor the brand new front entrance bed. 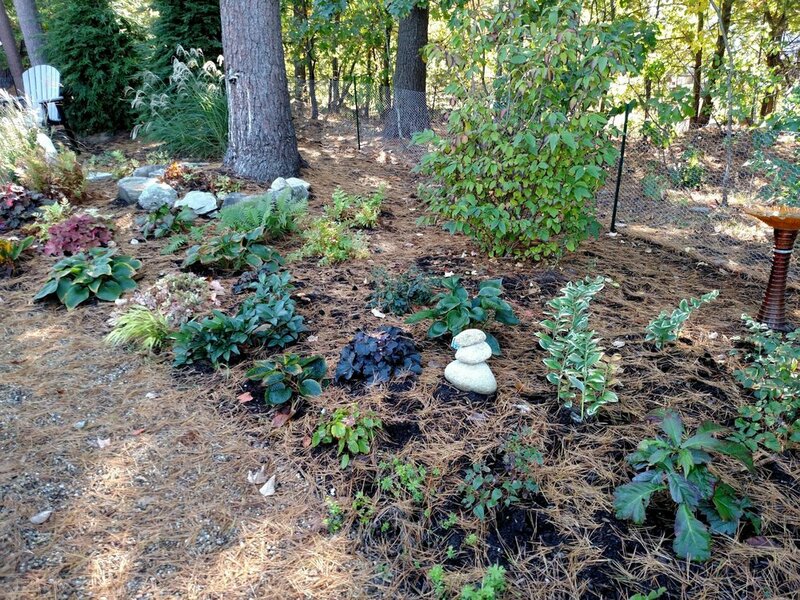 Additional dwarf conifers and ornamental shrubs were selected to expand the color palette of blues and purples. 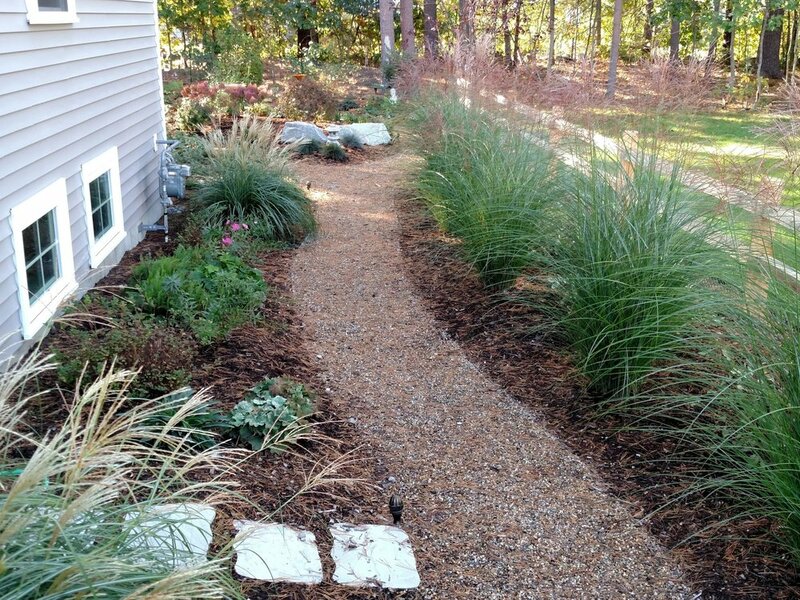 Parker Garden artfully cut a new sweeping front bed from walkway to driveway and prepared it for our new finds. 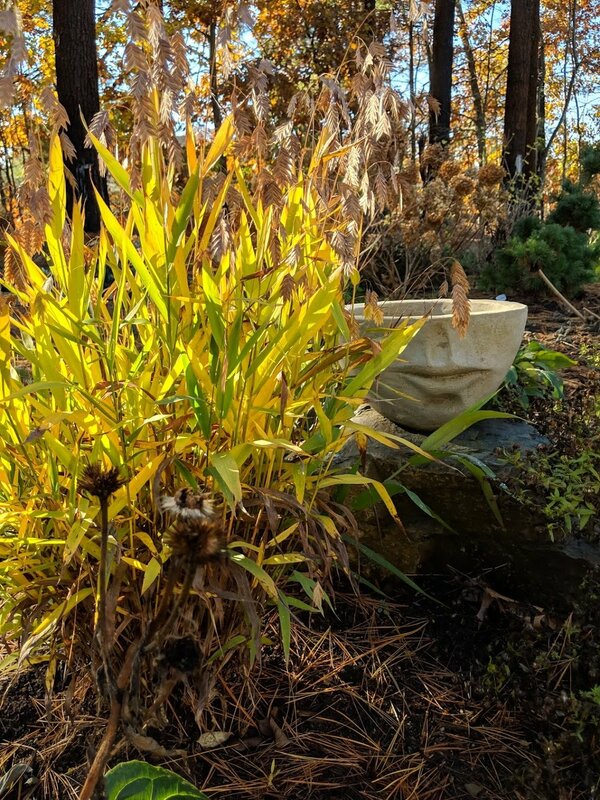 We continued to fill in with penstemon and grasses and finally, it was ready for the big reveal. 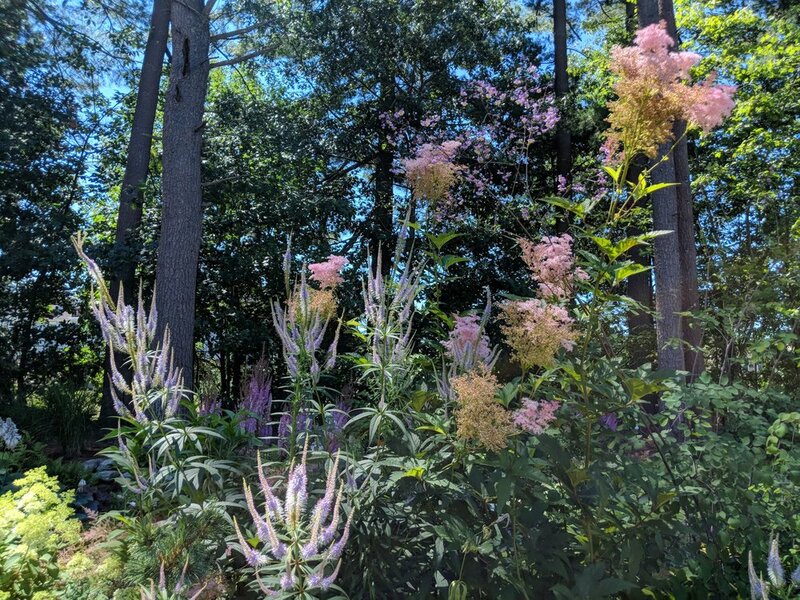 Visitors to the Collins' home are greeted by a sweeping mixed bed of ornamental trees, shrubs, grasses, sedum and perennials. 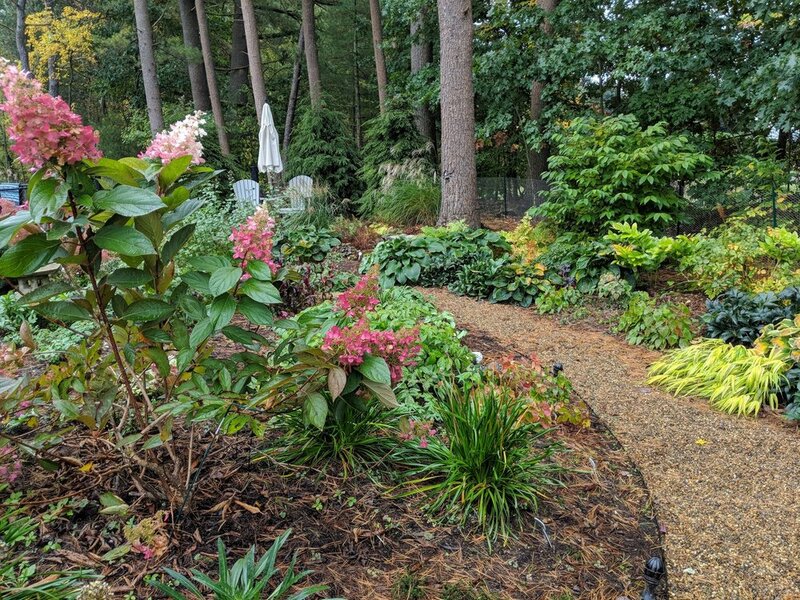 Fourteen months after we dug the first hole for planting, Vangie & Jack's garden participated in the 2018 Friends of Symphony NH Garden Tour. 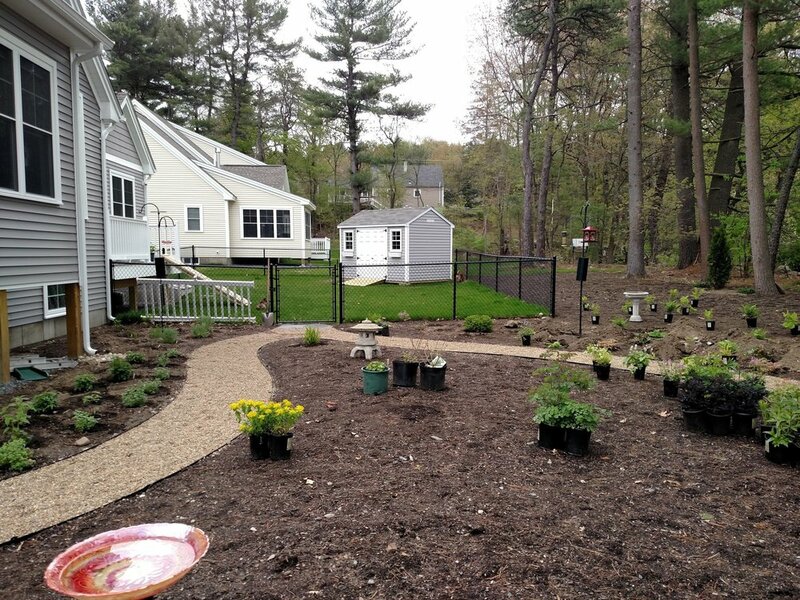 Visitors marveled at the garden, barely one year in the making!